Wow, it’s been a while since I’ve posted! I actually regularly “write” new posts in my mind, but time gets away from me and they don’t always make it into actual writing. But lately I’ve been rather overwhelmed trying to get my new house organized. I try to break it down to smaller things to organize, but sometimes it’s all I can do to make sure that my floors, dishes, and laundry are clean. That’s what’s primarily required for my children to have a better house than I grew up in, and sometimes that’s almost too much, too overwhelming for me. But essential, of course. 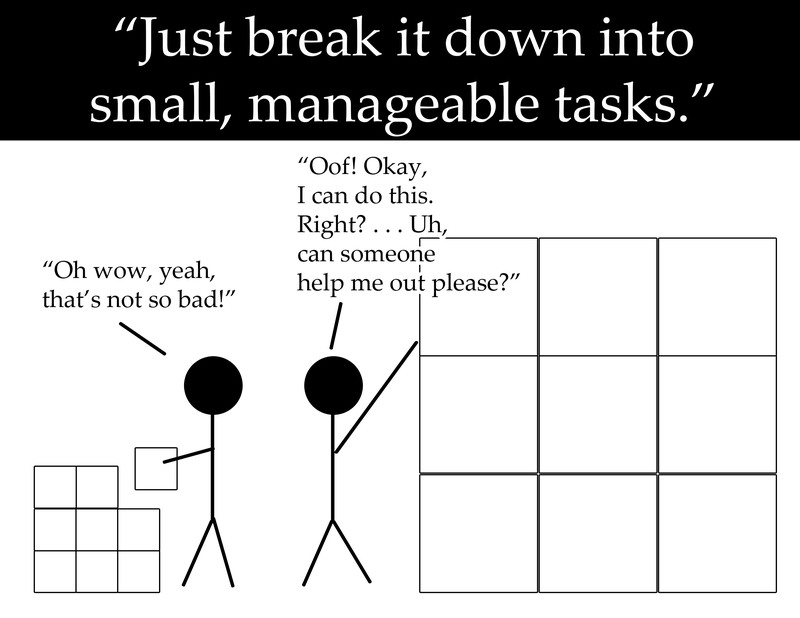 So I made a little stick figure picture of what it feels like when people advise me to break things down into smaller tasks. I imagine the person on the left is what those smaller tasks must feel like to them, and thus their advice comes from a good and reasonable place. The person on the right is what many tasks (especially organizing and getting rid of things–in the sense of still being afraid of the consequences of getting rid of something someone else wants to keep or thinks we should have kept, even though I know consciously that it’s my choice now not theirs) feel like to me even after being broken down.